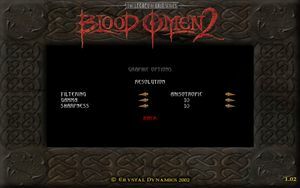 Use Helix Mod: Legacy of Kain: Blood Omen 2. Change V-Sync in the game's setup program. Access the program with this parameter: "bo2.exe -setup"
Unlocked. Surpassing the 900-1000 fps range will slow down the main menu a lot and produce a physics glitch (brief teleporting and getting a bit stuck) when you touch walls or other geometry elements. 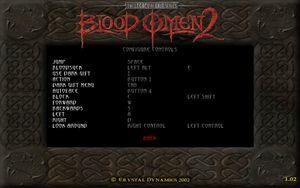 Game can be played with controller, but must use keyboard and mouse for main and pause menus. 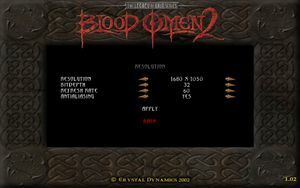 See Helix Mod: Legacy of Kain: Blood Omen 2. Download the latest dgVoodoo 2. Extract dgVoodooCpl.exe and MS\D3D8.dll to your game folder (both to the root). Run dgVoodooCpl.exe from your game folder. 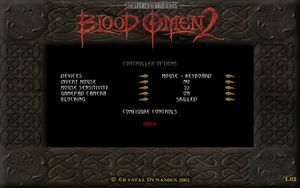 Click on the .\ button in the upper right corner of the dgVoodoo Control Panel to set the config folder to the game folder. Click on the DirectX tab and disable dgVoodoo Watermark near the bottom. (Optional) For the best image quality, also set Filtering to Force anisotropic 16x and Antialiasing (MSAA) to 8x. 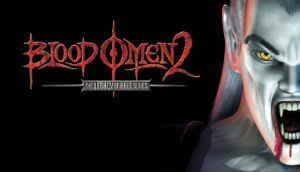 Download the Legacy of Kain Blood Omen 2 Windows 10 patch. 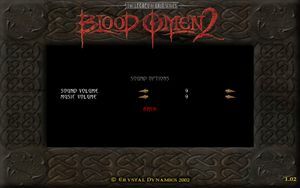 While in main menu minimize the game by pressing Alt+Tab ↹. Open the Task Manager (Ctrl+⇧ Shift+Esc) and click on the "Process" tab (or "Details" on newer versions of Windows). Right click "bo2.exe" and click "Set Affinity". Make sure only "CPU 0" is selected. The game now runs on only one processor core and should work without any crashes. ↑ 1.0 1.1 File/folder structure within this directory reflects the path(s) listed for Windows and/or Steam game data (use Wine regedit to access Windows registry paths). Games with Steam Cloud support may store data in ~/.steam/steam/userdata/<user-id>/242960/ in addition to or instead of this directory. The app ID (242960) may differ in some cases. Treat backslashes as forward slashes. See the glossary page for details. This page was last edited on 5 March 2019, at 00:31.